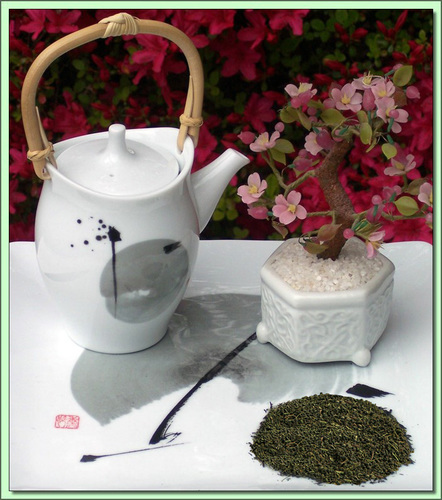 Character: Exceptional green tea flavor with sweet ginger finish. Looking for a spicy antioxidant boost? Ginger Green HiAntiox provides an antioxidant punch of Kenyan green and Japan Sencha teas, both known for high polyphenol counts with the goodness of pure dried ginger. Teas grown at the high altitudes both the Koisabei Dryer Mouth and Japan Sencha are grown at exhibit high antioxidant counts. The direct sunlight at such altitudes combined with the clear, pure air boosts leaf photosynthesis, which in turn boosts antioxidant levels - a true win/win situation. The result is a wonderfully smooth, slightly grassy green tea layered by the delicate spice of fresh ginger - a refreshing cup that's sure to put some spice in your step! Ingredients: Luxury green tea, Natural dried ginger, calendula + sunflower petals. Hot Tea: This tea is best enjoyed by pouring 180F/90C water over the leaves (1-1 1/2 teaspoon) for 3 minutes (longer=stronger). Don't remove the leaves. Infuse repeatedly 2-3 times using higher temperatures & shorter infusions until flavor is exhausted.